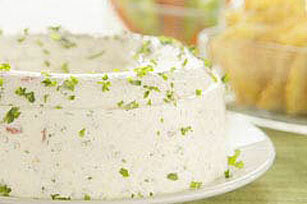 Sherry, seasoned salt, parsley and pimientos add flavor and color to this appetizer spread made with cream cheese, crabmeat and unflavored gelatin. Sprinkle gelatine over water in small saucepan; let stand 2 minutes to soften. Cook on low heat until gelatine is completely dissolved, stirring constantly. Pour into large bowl of electric mixer. Add cream cheese; beat on low speed until well blended. Add sherry, seasoned salt and pepper; mix well. Stir in crabmeat, pimientos and 2 Tbsp. of the parsley. Pour into 3-cup ring mold. Refrigerate 4 hours or until set. Unmold onto serving platter. Sprinkle with remaining 2 Tbsp. parsley. Savor every bite of this tasty dip, but watch your portion size. Substitute 1 pkg. (6 oz.) frozen crabmeat, thawed, for the canned crabmeat. Dip mold quickly in warm water; loosen crab ring from side of mold with tip of knife. Invert onto platter. Makes 24 servings, 2 Tbps. each.